People took to social media Friday night reacting to the released bodycam footage of an arrest in Glendale that has led to a lawsuit over abuse of force. GLENDALE — Dozens of users took to social media to react to the raw body camera footage shown on ABC15 Friday. Here are some of the outraged comments sent to our newsroom. "Shame on you folks for defending this bunk! 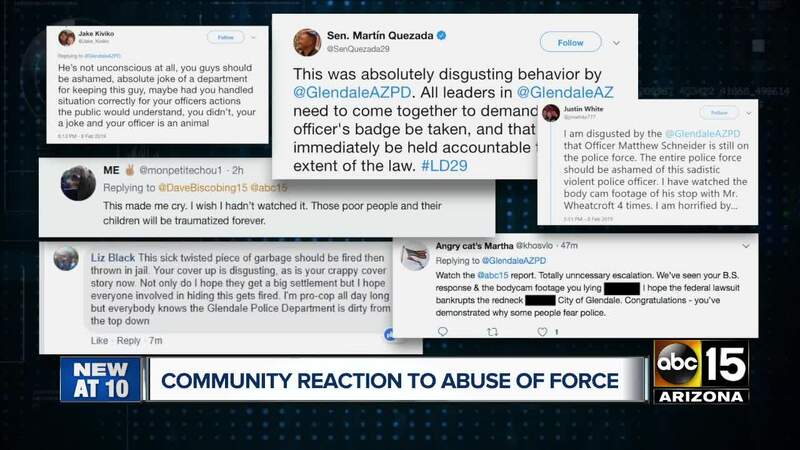 In doing so, you've just told your entire community that Glendale Police officers are not only NOT held to a higher standard, they actually sink pretty low," wrote Patricia S.
"This sick, twisted piece of garbage should be fired then thrown in jail," said Liz B. "Your cover up is disgusting." Jake K. added "You're a joke and your officer is an animal." "No human being should be allowed to wear a badge who did what we see in that video" said attorney Antonio Bustamante. "That’s the legal right of anybody not to start to handover papers or documents, it’s not the Soviet union, the officer is not a member of the Gestapo, this is the United States of America, we have a constitution that says things that those officers are supposed to protect."